So, the first thing that comes to mind when I think of summer is... activities! I am excited to keep my kiddos busy this summer, and hoping that because they are BUSY- they will be happy! I've had these frames for a couple of years. They've been sitting in a corner just waiting for the perfect project. This is it! This is what the frames originally had in them. this will make it dry erasable! makes the black vinyl POP! Now we can check them off as we accomplish each one! Just write right on the glass! 60 days of summer, 60 activities to keep them entertained! ...and both boys have their very own GOALS!! They are so excited to start checkin' things off the list! These look so cute,classy and clean! Really fun idea! Maybe if they finish all 60 early, they can erase and start all over again! Such a cute idea! I love the burlap! I love the idea of putting the vinyl on the glass instead of under. It looks SO good! Amazing project, Marni! I adore it!! Such a wonderful idea! I just voted for you. I LOVE this project! I definitely voted. Thanks for popping over to my blog and becoming a follower. 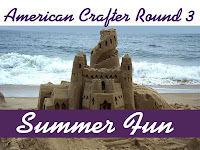 Good luck with the American Crafters contest. And mark me as voted!!! Would you put up a print out of your 60 days of summer activities? I love how you organized your list. I made something similar but we randomly draw out activities to do. However, "the randomness" has caused drama because there are a few activities my son REALLY, REALLY wants to do!!! I am a brand new blogger and you can check out my list at: http://beckysbuzzings.blogspot.com/2011/05/actual-summer-bucket-list.html. I love the vinyl on the burlap. We made our list yesterday but my kids don't read yet so it's a coloring in one. Have a fun summer! Great idea, I bet my little boy would love to come up with a list like this. I hope to do some fun activites like these over the summer in addition to helping him keep his academic skills sharp, I blogged about those plans here hope you stop by. Such a great idea! thanks for linking! I'll be featuring this on BCD tomorrow and inviting my readers to head over for full tutorial! love this! what font is this! OMG I LOVE,LOVE, LOVE this! I have three little ones of my own and they have 5 cousins. I'd better get busy, LOL!!! Genius - I love this project!!! Thanks for posting this I need to do something like this at my house! Thanks for the summer list ideas too! I'm a new follower and will be featuring this on my blog Tuesday! LOVE this!! Love it with the vinyl. It makes it so easy to reuse each summer. Fantastic job! !